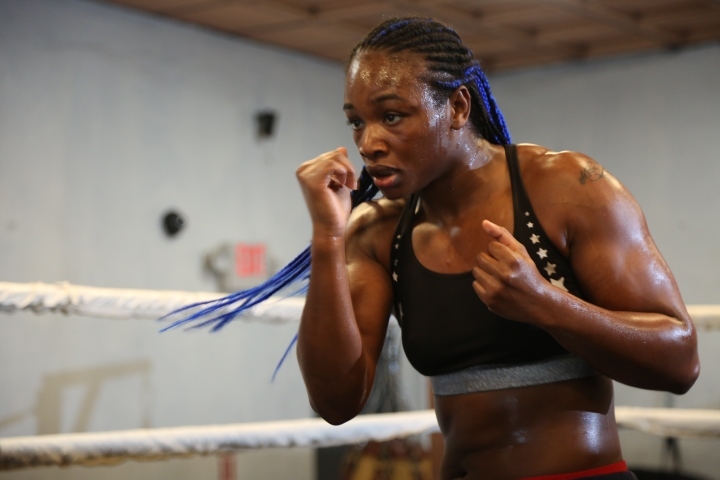 NEW YORK – Claressa Shields was taken aback by what a WBC official stated during a press conference four months ago. He rationalized the supposed need for two-minute rounds in women’s boxing by claiming those that run sanctioning organizations and commissions must protect women fighters from themselves. Unlike male boxers, he claimed women in this sport aren’t built to withstand competing for three full minutes per round. Shields took exception to that explanation. “I’m 24 years old,” Shields told BoxingScene.com following a press conference Wednesday in Manhattan. “I’ve been grown for a very long time. I don’t need to be protected in boxing. If that’s the case, you also need to protect the men. They have more knockouts because of the three-minute rounds and 12 rounds. If that’s the case, we shouldn’t be in the sport. That official’s comments, made two days before her unanimous-decision victory over Femke Hermans on December 8, piqued Shields’ curiosity. Shields determined after doing some research that two-minute rounds actually hurts women who box. The IBF, WBA and WBC middleweight champion is convinced that two-minute rounds have prevented some of the top women’s boxers in the world from scoring more knockouts. One of the most common criticisms of Shields is that the two-time Olympic gold medalist doesn’t knock out her opponents. She felt that she hurt Hermans twice during a 10-round fight HBO broadcast from Carson, California, yet Shields (8-0, 2 KOs) ran out of time in both of those rounds to finish the job. Each of Shields’ past four fights have gone the 10-round distance. Her opponent Saturday night, WBO middleweight champ Christina Hammer, is 24-0, but only 11 of those victories have come by knockout. They’re hardly alone, according to Shields. “You look at the top fighters, from myself, Christina Hammer, Cecilia Braekhus, Amanda Serrano – a lot of those girls are big punchers,” Shields said. “Cecilia Braekhus has been dominant for years, but people will say that she’s 38 and 0, or something like that, but she only has nine knockouts. Even with Christina Hammer, she’s bigger and stronger than all the girls that she’s fought. But she’s 24-0, with only 11 knockouts. The Colombian-born, Norway-based Braekhus has knocked out only nine of her 35 opponents on her way to winning the IBF, IBO, WBA, WBC and WBO welterweight titles. Brooklyn’s Serrano, who has won world titles in seven weight classes, has the highest knockout ratio among the top female fighters Shields mentioned (36-1-1, 27 KOs). Ireland’s Katie Taylor – the unbeaten IBF, WBA and WBO lightweight champion, is on a collision course with Serrano. Taylor has knocked out less than half of her professional opponents (13-0, 6 KOs). Shields attends a lot of fights featuring men, particularly those involving male boxers with whom she is friendly. She notices just how much that extra minute means while watching some of those fights up close and personal. “With the men, that extra minute matters,” Shields said. “Three minutes, it really does matter. And then, even with two minutes, I have to be at a higher pace and I can’t set up the punches the way that I want to because it’s like I’m trying to win a round. So, I can only do so much feinting and stuff to get shots open, when, in three minutes you have more time. So, I think that with the three minutes, you can wear your opponent down. Shields didn’t always appreciate the need for women fighting three-minute rounds. In the beginning of her career, she didn’t pay that one-minute difference much mind. Eventually, however, Shields realized that their fight for equal pay and equitable billing has been made more difficult by not allowing women to box three-minute rounds or 12 rounds in championship matches. The Flint, Michigan, native’s middleweight title unification fight against Hammer is scheduled for 10 rounds Saturday night in Atlantic City, New Jersey. If it is as competitive as many people suspect, viewers and those that attend their Showtime main event at Boardwalk Hall’s Adrian Phillips Ballroom seemingly should want 10 more minutes of action – or 16 additional minutes, if 12 rounds were allowed for women. The 28-year-old Hammer, of Dortmund, Germany, was less demonstrative than Shields regarding the issue of two-minute rounds. She does agree with her rival regarding perception overpowering reality. [QUOTE=Madison boxing;19652959]She looks like the predator[/QUOTE] She looks like Charles Martin's brother. [QUOTE=Luilun;19653581]Shields is a Hermaphrodite[/QUOTE] Just like your mother.